If you’ve met me you probably know I could do with shedding a few pounds. I’ve always been pretty large although the weight does fluctuate. I suffered pretty badly as a child from name-calling and other bullying. It affected me then and it affects me now. Something that has really become noticeable to me in recent years has been the keenness of various groups of people being either overly politically correct about how a group they belong to is represented or shouting loud and proud about their representation at different events. Quite rightly so. We live in a diverse society and so there should be some kind of representation of that in our schools, in our police forces and other public services. I’d also agree that those looking to organise big events should try to (note the use of the word ‘try’ – I’ve seen some prominent social media ‘super tweachers’ talking about lack of representation previously at events where despite trying to get a broad spectrum of speakers, e.g. BAME or with gender splits they haven’t been successful at attracting those speakers) have representative groups at these events. This post however isn’t about these groups at events. It’s not even about any lack of representation. It’s not about getting better representation of fat people at events or in jobs. This is me talking about the big guy. The big man in fact. Me. In recent weeks a number of people have taken to calling me ‘big man’. “Alright big man?” they say. “Hey, big man!” says another. “How you doing, big man?” says one more. Now I realise that these people aren’t trying to be overly rude. They’re not trying even to be malicious. Clearly as you can see above, some are just including it in their thanks. But it has got me thinking and so I’ve discussed it with some friends. Some of them have said perhaps it’s because of my status at events or linked to my status on social media, so forth and so on, either way though, if I’m honest, it’s upset me. It has really has left me thinking too. Is it appropriate? Is it right? I don’t think so. I love the video below. Viewed more than 61 million times, it’s a powerful reminder that saying things such as “Throwing ‘like a girl'” is wrong. 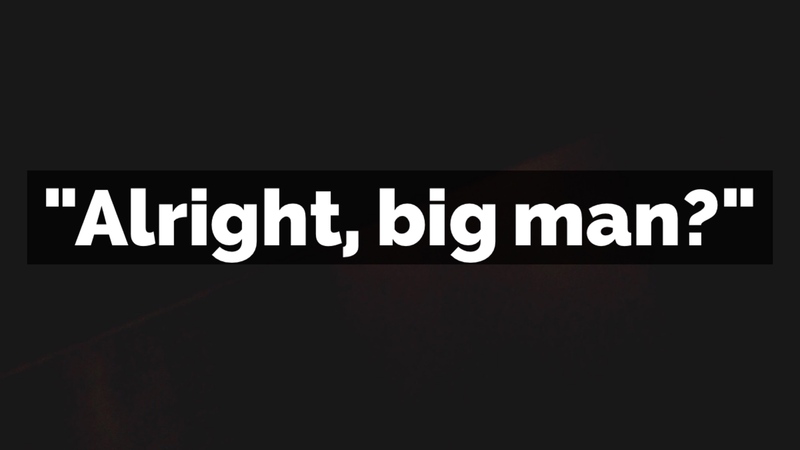 I contend that in the same vein, calling me ‘big man’ is equally offensive. Emotional intelligence or ’emotional quotient’ (EQ) is massively important in our role as teachers, as parents, as leaders… we try hard to ensure that we show respect to each other too in our interactions, in our conversations, in our professionalism…. Can we try “Alright Mark?” or “Hey Mark!” or “How you doing, Mark?” instead. Can we? I’d be so much happier.